Much of what we think we know about corporate weight loss programs is wrong. Yet weight is the #1 source of fines and incentives for outcomes-based programs. And any program, or any employee in the program, is considered successful when weight declines, however temporarily. Consequently, it is important to replace ten myths with ten facts, before proceeding with employee weight loss programs. We'll start with body mass index, or BMI. #10 BMIs were never intended to be used for mass screenings, and have no basis in clinical research. ‍The BMI was invented by a mathematician almost 200 years ago, who for some reason -- possibly because he was a mathematician -- decided to square a person's height in order to get it to line up with weight. It is true that height and weight are more than linearly related, in that someone who is 6 feet tall would weigh more than 20% more than someone who is 5 feet tall. However, there is also no reason to think that squaring the height solves the problem either. Anatomy doesn't lend itself to ninth-grade quadratic equations. Use of BMI as a measurement also means that natural shrinkage in older adults will increase their BMI. ‍#9 The healthiest people may be in the "overweight" BMI range. ‍A BMI between 25 and 29 is classified by the Centers for Disease Control and Prevention as "overweight," as opposed to a "healthy weight," which is the range between 20 and 24. And yet the one large-scale study that matched BMI to death rate found that the longest-lived people had a BMI of 27. This held true for death due to cardiac disease as well as all-cause death. Other data shows that ideal BMI would be lower than 27, so it's safe to say that the "ideal weight" debate is far from settled. But anything incorporated into a wellness program should be settled science. Otherwise, you may be harming employees without knowing it. Think of all the employees whose wellness vendors counseled them to eat less fat, and hence more carbs, only to put themselves at higher risk for diabetes. #8 Almost half the people in the overweight and even obese BMI categories are actually healthy, metabolically speaking. ‍It turns out it there are three reasons higher-BMI people do better than expected: almost half of them are actually, metabolically speaking, healthy. First, bones weigh more than muscle or fat, making a high BMI reading more likely for people with larger bones. Second, BMI doesn't capture the distribution of weight, so that someone who has upper body strength will show an "unhealthy" weight even while being healthier than you or I. Finally, even many people who look fat are metabolically normal -- no "metabolic syndrome" of high glucose, cholesterol and blood pressure. Hence the predictive value of a BMI, as a risk factor for "overweight" employees, is not much better than a coin toss. ‍#7 One-third of people with "normal" BMIs are metabolically unhealthy. ‍The reverse is almost as true too. Having a "normal" BMI doesn't necessarily mean you're healthy. About a third of people with normal BMIs shouldn't be resting on their laurels, because they have other risk factors for cardiac disease. ‍#6 The mis-application of BMIs varies greatly by race and ethnicity. ‍We've already seen how older employees are penalized by BMI measurements, due to natural shrinkage. However, the predictive value of BMI varies by race and ethnicity as well. For the next five unappreciated factoids, we'll be talking about weight generally, rather than BMI. 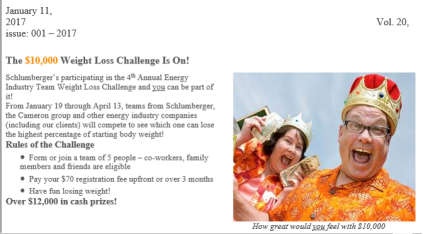 ‍#5 Crash-dieting contests -- "dieting for dollars," etc. -- are a bad idea. ‍Employees manage what's measured, especially when -- as with a program in the oilfield services industry -- there is $10,000 at stake. If you put that much money at stake to lose weight, people will lose weight. Sure, they'll have a good time, and collect your money, but they'll harm themselves in the process. #4 The likelihood of people regaining the weight they lose in any diet is close to 100%. ‍This observation has been done to death, so I won't repeat it. But have you ever noticed that every single published corporate weight loss study ignores dropouts and non-participants? Those are called "last man standing" programs, where only the people who make it through to the end are counted. And the "end" is usually only a year, if not 3 months or even -- as in the example below -- eight weeks, after the beginning. #3 Weight-cycling (also known as "yo-yo dieting") may increase likelihood of adverse health outcomes. ‍The idea of crash-dieting contests is bad enough. Cheating, harming oneself and regaining the weight would suffice to take these off the table. But weight-cycling can very substantially increase risk of cardiac events and strokes. Further, the people most vulnerable to cycling-induced events are exactly the ones that employers need to be most concerned about, meaning people who already have diagnosed or undiagnosed heart disease. ‍#2 Setting artificial weight targets takes employees' eyes off the movement/activity ball. ‍While essentially every study examining the effects of exercise finds positive outcomes, few people lose weight through exercise. As a result, cajoling employees to lose weight may very well discourage them from doing more exercise, and impact their morale generally. And especially if they are in a weight-loss contest, starving themselves, they probably won't feel like exercising. The difference between increasing activity and trying to lose weight is that the former is within our control. The latter isn't. ‍#1 No company has ever saved a nickel with weight loss. ‍It's not just that wellness hasn't worked and paying people to lose weight doesn't work. It's that there is not a shred of evidence that any company has ever saved a nickel through cajoling employees into losing weight again and again, each time they gain it back.